I don’t know about you, but I always find making mind maps a bit difficult. I like how they look and I think they’re a wonderful way to plot ideas, but I’m a listmaker, and I don’t always find it easy to start with the idea in the middle and work outwards. 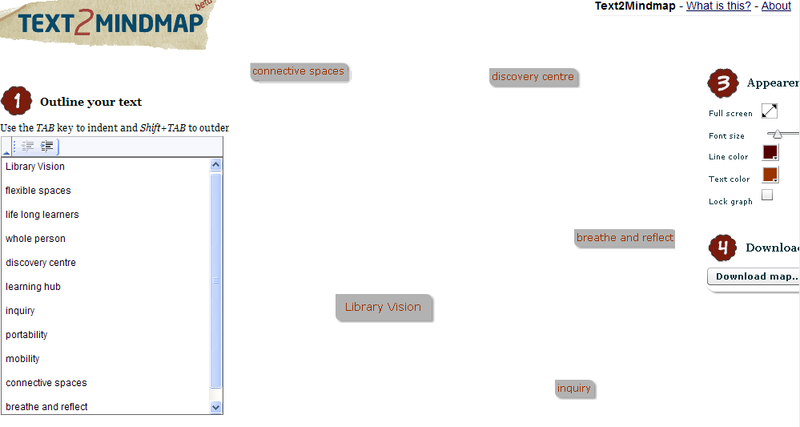 I think this is why Text 2 Mind Map holds such appeal for me. What you do is write your list in a box on the page and then press convert it. 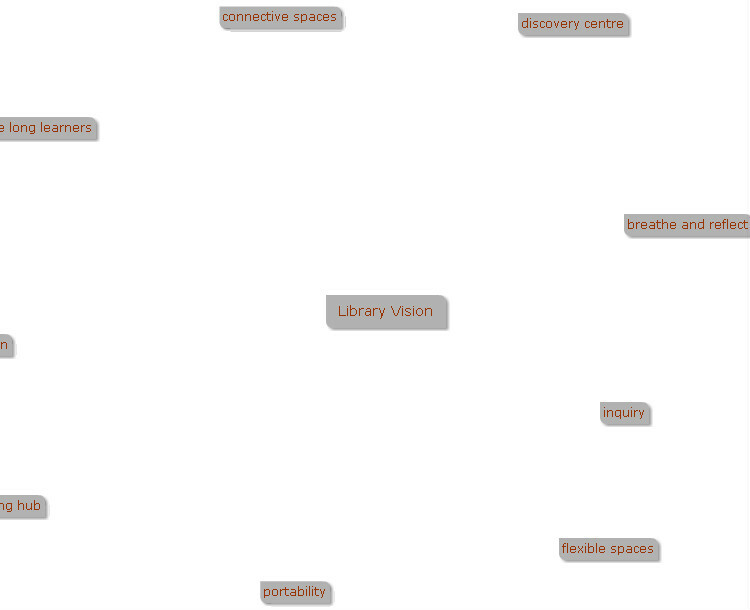 Your text will then be interpreted as a mind map. You can move the boxes around to the configuration you want. I haven’t yet worked out how to link them with arrows, but that will come with a bit more fiddling! Thanks once again to the inimitable Jane Hart for directing me to this site. Laura Stockman – inspiring others across the waves. Sunday morning I was grazing through my Google reader, kicking back and hoping I’d find something that would inspire me to write. I found something better than that, I found something that inspired me to act. I checked out Will Richardson’s latest post and discovered Laura Stockman, an 11yr old from New York who has been writing a blog called Twenty five days to make a difference. Laura’s mother Angela was involved with Will and Sheryl Nussbaum Beach’s PLP cohort and Laura was inspired to write a blog as a result of this. Her blog was written in honour of her grandfather and Laura has set about performing good deeds with the resulting donations going toward charity. Laura’s blog has moved beyond the initial 25 day target, largely because Laura has felt empowered by what this experience has meant for her. You know, when Laura decided her blog was going to be more than a twenty five day experience, I questioned her decision. Laura gets it. She already knows that it’s self motivation and belief that can drive you forward. Some of us don’t get this until we’ve had a fair bit of life experience, if we ever get it at all. Here’s an 11 yr old teaching us how to navigate life. Is anyone else out there interested in doing this? I really enjoy blogging and Skyping about blogging and ways that kids can make a difference. This is really cool. The students at my school in Melbourne, Australia would love to have you Skype into our classroom. Time differences between our countries is a bit of a problem. It may well be you would have to Skype in in the evening. If you are interested you can email me at jenny.luca1@gmail.com. We raise money for local and international charities at the end of our school year and your story would be inspirational for them. I would LOVE to do a skype chat with you! My dad and mom are really excited about this too! I’ve never met anyone from Australia before! I can definitely do this in the evening. Please just let me know what works for you and your class. Thank you so much for this invitation!!!! My class is responding with just as much enthusiasm as Laura. They’re posting comments on her blog and already we’ve been discussing what we can do to help Laura and her charitable efforts. She is going to Skype into our classroom next Wednesday morning our time (evening her time) and my class can hardly wait. Already Laura ia extending her reach globally and her 25 days project looks set to ignite action all the way to Australia. If I’ve learned nothing else this year, it’s been precisely that: when we are truly committed to making something happen, it happens. It doesn’t matter who or what might be standing in our way. If the goal means something to us in the end, we don’t let our fear or our lack of resources or the politics of a situation or our bruised egos stand in the way. We just make things work. Because it matters, this work that we do, and it’s bigger than the credit that anyone could receive or the mistakes that might be made along the way. What an amazing affirmation for a young girl with a desire to make a difference in honour of her grandfather. Thanks Laura. You are an inspiration. Make your maths class fun. Think I’m having a YouTube week. Flicked into Twitter very briefly today and saw a tweet from Jeff Utecht with the link to this video. Here’s a way to start your next maths lesson – ‘I will derive’ is the name of the YouTube video. It’s all about calculus and uses impetus from Gloria Gaynor’s ‘I will survive’ to make a maths concept more interesting. Who said maths was boring! I read about Snackr while browsing through Download Squad via my Google Reader. If you read a lot of blogs you’ll know that you have to have a means of managing the plethora of information you want (need!) to consume. My reader is invaluable – I subscribe to sites by pasting the url into the add subscription box within the reader and any new feeds from the blogs I subscribe to come to me directly. I don’t have to open a new tab and open the site each time I want to see what people in my educational network are writing about. What I’ve found recently is a lack of time to get to all the reading done. Now that I’m active on Twitter coupled with the demands of my job (not to mention my family obligations!) I’m finding I’m time poor in relation to my reader. Although I’m finding the connections I’m making via Twitter incredibly valuable, I’m lamenting the fact that I’m missing some of the deeper thinking that is evident when you read what people are posting in their blogs. Snackr is going to help me manage my reading. Download Squad have explained it really well so I’ll block quote from them rather than try to paraphrase their thinking! Snackr is an Adobe AIR-based RSS ticker that pulls random headlines from your RSS feeds and scrolls them along the bottom or the side of your screen, letting you click through to read anything that looks interesting. It’s not a replacement for your regular RSS reader, but it makes a great supplement. Snackr’s well worth checking out if you’re an information addict who has to have the fire hydrant open at all times. I suppose I am turning into an information addict. I downloaded Snackr (you have to make sure you have downloaded Adobe AIR first – easy to do) and now it’s running along the base of my screen. I’ve added feeds to the basic set that came when I downloaded the application. You can easily add or delete feeds. The scrolling was moving too quickly for me so I slowed it down – less likely to have an epileptic seizure now! Already I can see the benefits. I’m not finding the scrolling too obtrusive and I can easily click on an item that might be of interest. When I do up pops a box with part of the post visible. A quick read indicates whether or not I want to view the post in its entirity. Again, easy to do. Just click ‘view post’ and you’re redirected to the source. If it becomes obstrusive you can collapse the ticker (I think that’s what it’s called!) so that you can concentrate on a task at hand. I’m liking it so far! Thanks Jay Hathaway from Download Squad for giving me the heads up. Here’s a great way to learn about chemical reactions. What’s the bet students would remember how elements react a whole lot better from watching this rather than listening to a lecture from their teacher! !